Severe deficiency of vitamin D in adults can cause musculoskeletal pain, stiffness, and joint discomfort. Musculoskeletal symptoms similar to those associated with vitamin D deficiency are frequently seen in breast cancer patients receiving adjuvant aromatase inhibitors (AIs). This is presumably due to oestrogen deficiency caused by AIs. However, no data are available on serum levels of vitamin D and their relation to developing musculoskeletal symptoms/arthralgia in women receiving an AI. 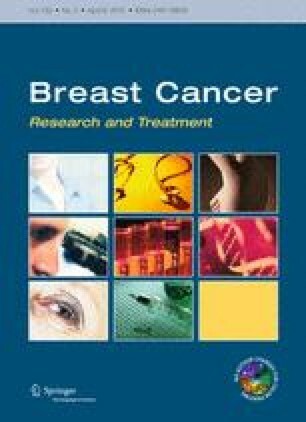 IBIS-II is a multicentre randomized placebo controlled trial of the AI, anastrozole, in postmenopausal women aged 40–70 years, who are at increased risk of breast cancer. Serum vitamin D levels were measured for 416 participants. The samples were sent for assays in three batches: the first two batches (n = 250) included paired serum samples and the third batch (n = 166) included paired samples and samples from women who had arthralgia within the first year of follow-up. At entry, 56 (13%) women had adequate (≥30 ng/ml), 173 (41%) had inadequate (≥20–<30 ng/mL), 167 (40%) were deficient (>10–<20 ng/mL), and 24 (6%) were severely deficient (<10 ng/mL). At the time of analysis, 225 out of 834 (27%) women had reported arthralgia within the first year of follow-up. Baseline serum vitamin D levels did not significantly predict arthralgia within the first year of follow-up either in the overall group (OR 0.87 (95% CI: 0.67, 1.13; P = 0.30) or separately in the anastrozole (P = 0.60) or placebo groups (P = 0.38). Absolute serum levels of vitamin D increased significantly at one year in the anastrozole group (2.88 ng/ml, [1.71, 4.06; P < 0.0001]) but not in the placebo group (0.75 ng/ml [−0.35, 1.85; P = 0.18]). Only a small and a nonsignificant effect of baseline vitamin D levels were seen on the risk of musculoskeletal symptoms. This does not appear to be a major determinant of risk for these symptoms. This study was conducted on behalf of the IBIS-II Investigators. Authors do not have a financial relationship with the organization that sponsored the research.